This Classic Radio Flyer Tricycle is perfect for any toddler looking to ride in style. 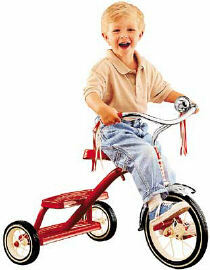 The 12" front wheel and sturdy steel construction of this trike assure a stable ride. The #33 features a double deck rear step, steel spoked wheels with rubber tires, streamers, and a ringing bell! Durable steel spoked wheels with real rubber tires. Rear Wheels: 7 " x 1 1/2"